Conference of Presidents, Young Israel applaud US for voting against UN resolution condemning Israel's presence in the Golan. 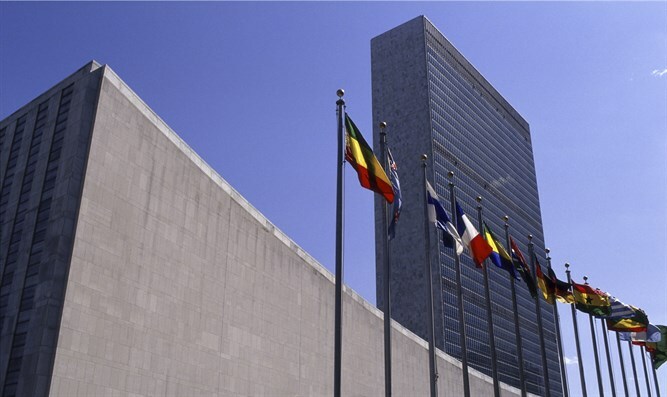 Arthur Stark, Chairman and Malcolm Hoenlein, Executive Vice Chairman/CEO of the Conference of Presidents of Major American Jewish Organizations, on Monday called for an end to the continuing anti-Israel bias at the United Nations. In a statement, Stark and Hoenlein praised the US for voting against the annual UN resolution declaring the Golan Heights to be territory “occupied” by Israel. “The United Nations General Assembly and agencies are once again engaged in the yearly anti-Israel ritual adopting a variety of biased and even baseless resolutions. We applaud US Ambassador Nikki Haley’s declaration that the US would vote against every single one of these resolutions, especially against the ‘Occupied Syrian Golan’ resolution on which the US abstained in the past,” they said. “As Ambassador Haley noted, ‘... if this resolution ever had any relevance it surely does not today the resolution is plainly biased against Israel.’ Given the situation in Syria and especially along Israel’s border on the Golan where Iranian militias Hezbollah and other terrorist groups are operating, the inanity of the resolution is apparent,” continued Stark and Hoenlein. “The long-standing anti-Israel bias has been repeatedly demonstrated and is deeply ingrained in UN deliberations. Hopefully, more countries will break with the automatic majority and demonstrate a commitment to the values and principles of the UN,” the statement concluded. The National Council of Young Israel (NCYI) also thanked President Donald Trump and Ambassador Haley for their support of Israel in voting “no” during the United Nations’ annual vote that criticizes Israel’s presence in the Golan Heights. “The National Council of Young Israel is deeply grateful to President Trump and Ambassador Haley for recognizing the absurdity and anti-Israel nature of the UN’s farcical Golan Heights resolution and electing to oppose it,” said NCYI President Farley Weiss. “The historic decision to voice its opposition to the UN’s latest resolution condemning Israel is yet another important example of the bona fide affinity that President Trump has for the State of Israel, and a testament to his desire to continue supporting the United States’ lone democratic ally in the Middle East,” Weiss concluded. The non-binding annual UN resolution condemning Israel's “occupation” of the Golan Heights was adopted by a General Assembly committee on Friday by a vote of 151 to 2, with the United States and Israel the only two countries opposing the measure. 14 countries abstained. Haley had announced the previous day that the US would vote “no” instead of abstaining, calling the resolution "useless" and "plainly biased against Israel" and citing concerns about Iran's military role in Syria to oppose the measure.